The Peruvian Bead Factory presents an incredible array of versatile, brightly-colored beads that are easy on the eye. You can choose from the adorable collection of assorted animal shaped beads or the funky hand painted ones or the geometrical hand painted ones. Display the sport fanatic in you with the ingenious sport beads based on baseball, basketball, etc. or wear your name or other message with the alphabet beads. Opt for the gorgeous ceramic pendants to create an eye-catching focal center piece in jewelry or ward off the evil eye with the Kabalah inspired design of metal amulet pendant! The only customer complaint we have received so far is that it takes them exceptionally long to decide what to buy from the extensive range of printed as well as hand painted beads in all sorts of enticing shapes and colors! New ideas of making decorative items surface in the mind’s eye by just looking at the attractive collection on display. Once you have finally zeroed in on a definitive choice after much deliberation, the issue of how to put the beads together emerges. Regular sewing thread or wire will not do. You need specifically designed and durable items to bring your interesting ideas to life. We help you indulge your desire to create handmade jewelry and other items with complementary accessories for beading work like craft wire and jewelry chains apart from cool and unique key chains, pens and photo frames. 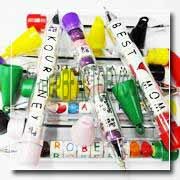 The most popular ones are the plastic pens to place alphabet beads to form your name or any other personal message of your choice. 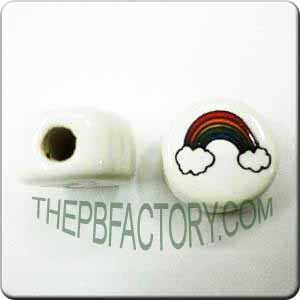 Available in different colors like red, blue, green, yellow, purple, pink and fuchsia, they can hold a variety of beads.